ABSTRACT: In this paper, I read the play Red Flag Song (1948) as a window into a moment of missed opportunity in China’s revolution, when the Party’s re-engagement with the urban working class could have strengthened democratic tendencies within the Party, and when China’s critical realist literary tradition could have grounded Chinese socialism in the real-life experiences and aspirations of the grassroots. Written at a time when the Party’s control of both industrial and literary productions had begun to tighten, Red Flag Song registered compromise as well as defiance on the shopfloor, and foregrounded two issues as deeply related and fundamental to the making of a New China: work-place democracy as the basis for making China’s working class, and realist literature as a means of understanding complexities and pluralities in social upheavals, and of ensuring a humane and democratic socialism. Unfortunately, the visions Red Flag Song carried were never realised in the following years. They remain unfulfilled promises of the Chinese revolution. KEYWORDS: Workplace democracy, critical realism, working class, production competition. ABSTRACT: Cinema, an extremely popular and useful cultural form during the Maoist era, played a big role in shaping working class subjectivity. This article argues that despite their highly politicised and formalised content, industrial-themed films made during the Cultural Revolution created a “masters of the nation” subjectivity that still resonates with workers who grew up watching these films. 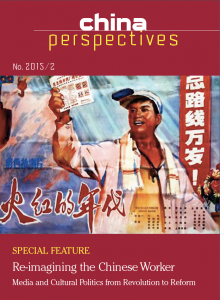 In doing so, this article brings together two bodies of scholarship that rarely make reference to one another: filmmaking in the Cultural Revolution period and post-Mao workers’ subjectivity. Post Mao scholarship has gone beyond simply dismissing films from the Cultural Revolution period as crude propaganda designed to create a highly politicised mass mind. It has drawn our attention to the more complicated nature of this body of filmmaking, particularly the “model play” films. However, new features made during the Cultural Revolution are often seen as “too ideological” to warrant academic attention. This paper attempts to find out how the “masters of the nation” discourse still resonates with workers who grew up watching these films. It argues that, despite the valorisation of workers as the privileged class and an excessive focus on class struggle, these films have indeed endowed the subaltern with the kind of agency that is lacking in contemporary media representations of workers. KEYWORDS: film, Cultural Revolution, workers, subjectivity, representation, Masters of the Nation. ABSTRACT: This paper uses a case study of the 2006 TV series remake of the Maoist classic The Red Detachment of Women to examine the way the reproduction of the Red Classics in the reform era has functioned to maintain Party foundation myths that validate and morally legitimise its continued rule while accommodating a major shift in class politics in Chinese society. By tracing the change in the identity of the central hero, Hong Changqing, from working class child labourer and son of an ordinary seaman to a middle class, wealthy, overseas Chinese with family origins in the local gentry, the paper argues that the TV series functions to consolidate the symbiotic relationship between the Party and China’s new middle class, while promoting a consumer lifestyle and consigning the working class to the margins of social and political power. KEYWORDS: Red Classics, Red Detachment of Women, Hong Changqing, China class discourse, China class politics, China working class. ABSTRACT: Over the past few years we have witnessed a minor cultural phenomenon in China, with the production and enthusiastic reception nationwide of several television dramas about Chinese workers in the socialist decades. Set in the industrial plants of Liaoning in China’s northeast, once the industrial powerhouse of the socialist nation, these drama series centre on the dramatic transformation in workers’ experiences from 1949 to the start of economic reforms. In this paper I explore these series, asking: what does the smallscale production but enthusiastic reception of this genre tell us about the contemporary cultural politics of class? This paper addresses this question by (1) highlighting the key aspects of workers’ experiences with socialism as depicted in these television narratives; (2) considering the creative agenda of Gao Mantang, the script writer of the most successful industrial-themed television series; and (3) identifying some crucial ways in which the subjectivity of workers and other social groups in contemporary Chinese society intersect to shape the cultural politics of class. This discussion shows that television dramas have indeed become the basis of a widely accessible public forum that helps forge a renewed appreciation of the moral integrity of China’s working class, vent a widespread sense of injustice, and foster a certain degree of solidarity between workers and other social classes. At the same time, while television dramas about workers may hold significant potential for mobilising public support for the working class and advocating workers’ interests, this discussion also suggests that so far this potential has not been fully exploited. KEYWORDS: Chinese workers, socialist era, television drama, politics of memory. ABSTRACT: This article compares the modes of organisation and engagement of birdwatching societies in Taiwan and Hong Kong. Tracing their origins to American, Japanese, and British models of nature conservation, it shows the growing involvement of Chinese citizens in the observation and protection of birds. Asking how birds can be used as “flagship species” to hold together environmental movements in a sustainable and constructive way, the article proposes the concept of “sentinel” to capture the mix of democratic environmental concern and a military model of territory mapping. KEYWORDS: birdwatching, flagship species, biodiversity, conservation, sentinel.